You remember I told you the story of Justin, who was a tiny one pound kitten when he was set on fire on the streets of Philadelphia. You may not have heard of another cat in Pensacola named Valiente, who was tortured in the same way. I am fortunate that even though I’m a diabetic cat, I have a human who cares for me and protects me. These two did not. These two cats saw how cruel and evil humans can be. Fortunately for them, they saw how kind and caring humans can be as well. 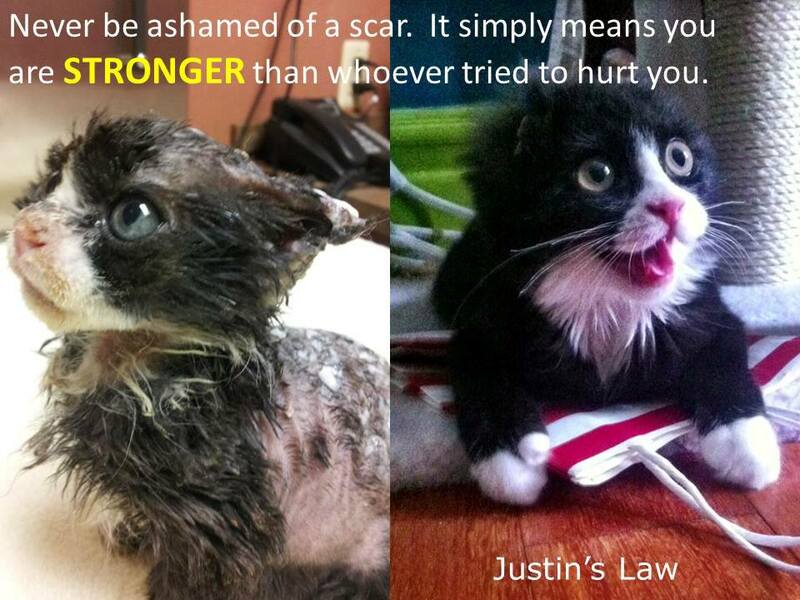 The kindness of humans started for Justin almost immediately after he was set on fire. A good Samaritan put the fire out. The Animal Alliance of New Jersey took him in, and the skilled veterinarians at Crown Veterinary Specialists treated him. He lost his ears due to the attack, but he survived, recovered, and now he has a home. Valiente’s torture lasted for longer. The poor cat was tied with twist ties, and dislocated one of her legs trying to get out of them. She also had lacerations and burned ears. The recovery from her injuries took longer, lasting four months. But just like Justin, Valiente is in her furever home. And while Justin went to someone who applied to adopt him, Valiente went to one of the kind humans who took care of her starting when she arrived at the Humane Society of Pensacola. Valiente’s human said “The first day I saw her, it broke my heart. I told them right away I wanted to take care of her.” And how this human will get a chance to take care of Valiente. She’s prepared her home for the feisty and friendly cat. These two tough cats have endured so much more than this diabetic cat ever has, and they have come through it showing nothing but love. They have shown they are tougher than the humans who tortured them. They’re just two of many special needs cats who need a human that can see past their challenges and give them a furever home.